There are literally dozens of shirt brands, styles of t-shirts, different weights of cotton and many other variations - we are here to help you find both the perfect shirt and to put your design on that shirt. 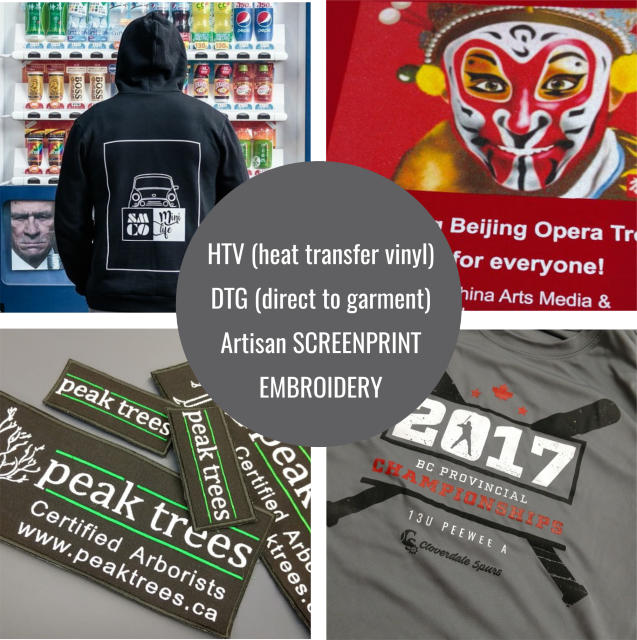 We use HTV heat transfer vinyl, DTG direct to garment printing, artisan screenprinting and custom embroidery from 1 to 500 - whatever you need done, we can do it. We offer a fast, friendly service. Get in touch and we would love to help you check out the different options available. We have access to most major brands and all their variations so we aim to provide you a complete service from shirt through printing/embroidery to the end result. Call 604 733 1402 or email kitstshirtexpress@gmail.com or tshirtexpress@telus.net and we would be happy to help. Instagram ... is kinda our thing. Check out our Instagram feed below - we put up a sample of our customers orders to highlight the variety of things that can be achieved. We hope they help to inspire your imagination!